Throughout history, regardless of the name, the spirit of the people who live within Silverdale Borough has remained the same. The small town spirit and caring of current and former residents makes Silverdale a great place to raise a family. Silverdale was not always called Silverdale. It’s first name was Paletown derived from the fact that the corner store built and operated by Henry Kaufman was fronted by a pale board fence. (Legend has in that it was sometimes referred to as “Glopboard Settle”, a Pennsylvania Dutch phrase meaning “fence pale village”) By 1870 the town had grown and the name was change to Portland. In 1876 the town was renamed Lawndale. A post Office was established in 1883 with H.C. Gerhart as Postmaster and was located in the corner store. The name was changed to Silverdale in 1895 and was incorporated as a Borough in 1896. The Borough Seal was designed by Lousia Wismer to commemorate Silverdale’s Centennial Celebration. The four parts of the seal include the Silverdale Fire Company established in 1914, The Silverdale Brethren In Christ Church built in 1883, the Municipal Building and the American Flag representing the proud patriotism of the people of Silverdale. The Silverdale Recreation Association (SRA) was organized in 1965 with the hopes of saving open space in the borough. The SRA was able to purchase a three acre wooded lot on Park Avenue thanks to many donations from local businesses, private citizens and a Federal Grant. The Borough Park has playground equipment, picnic tables, grills and tennis and basketball courts. In 1985 when the SRA disbanded, the Borough assumed the land, renovated the building and created the first Borough Office moving out of the Pennview Savings Bank and consolidating all the Borough records. 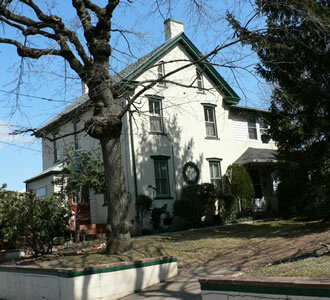 The Pennridge Senior Center was located in Perkasie Borough for many years. In 2007 they moved their home to a new facility in Silverdale. The beautiful facility provides more space, modern amentities and a great location, Silverdale Borough.